Another promise delivered, another history made. Today, Phase One of the Klang Valley Mass Rapid Transit Sungai Buloh-Kajang Line service comes online. This service plies between the Sungai Buloh KTM station and the Semantan station (across from UOA Jalan Semantan) will run for free for a month until the 16th January 2016. 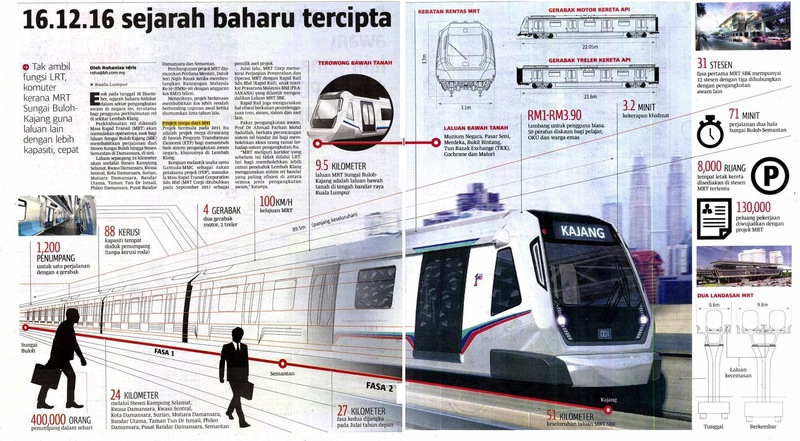 The project will be completed earlier than planned at RM2 billion less than the RM23 billion projected. 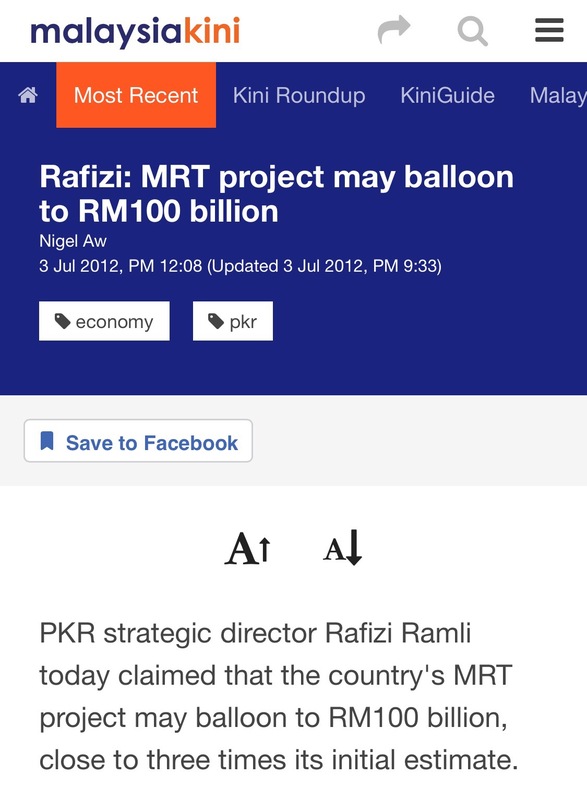 This is RM77 billion less than what was blurted out by PKR’s habitual and court-proven liar, Rafizi Ramli. 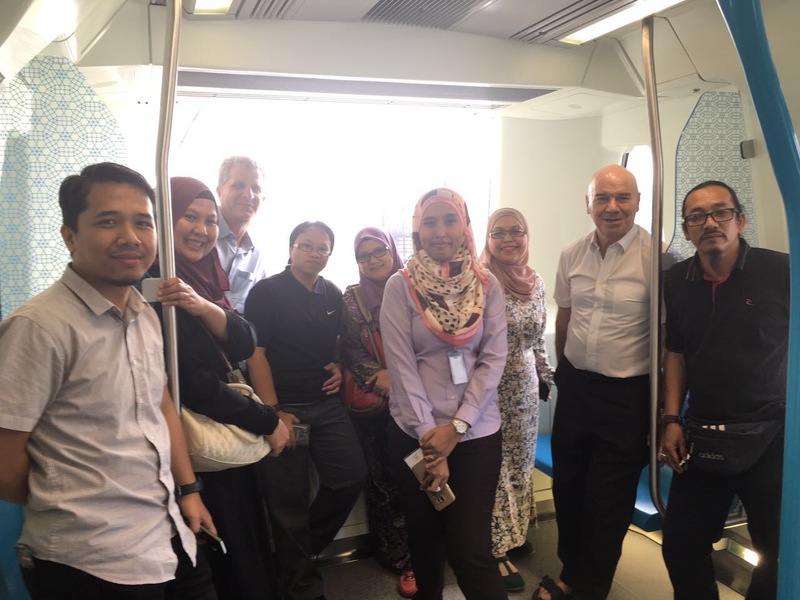 Once completed in April 2017, the MRT Line 1 will connect suburban areas with the urban networks servicing the city of Kuala Lumpur such as the LRT and KL Monorail. Prime Minister Najib Razak also made it a project term that there would be Bumiputera participation in all aspects of the project. 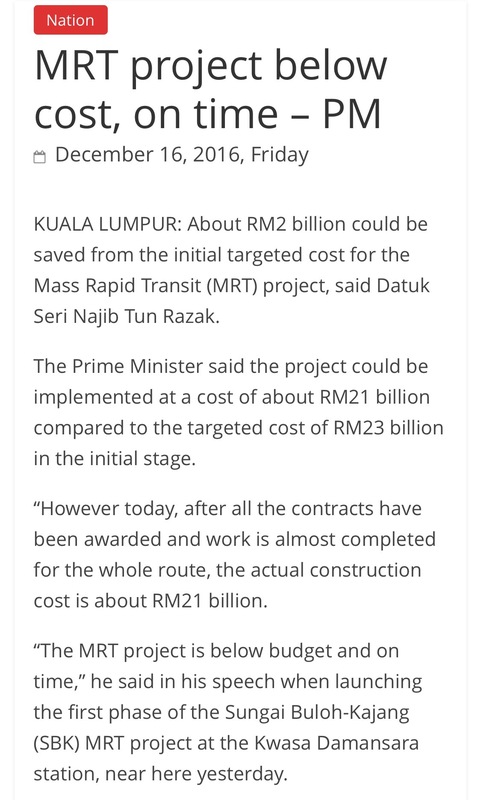 While previous administrations emphasised on 30 percent Bumiputera participation, Najib Razak through MRT Corporation ensured a minimum of 50 percent Bumiputera participation in the civil elevated works (viaducts and stations). Only in the underground works (tunneling and stations) as well as non-civil works (systems and integration) where foreign expertise is needed, Bumiputera participation must be at 30 percent or higher through joint-venture companies to ensure that technology knowledge-transfer takes place. I must make mention of two things. I was fortunate to have spent a large chunk of my time in the MRT project under the tutelage of Michael Harfoot, a Welsh resident of Hong Kong, who is very knowledgeable in the field of urban railway construction. Mr Harfoot remains one of the rare Chief Resident Engineers who could do and read as-built drawings without the use of computer aids. He also imparts knowledge to the local engineers with much zest. Secondly, the project would not have succeeded without the unenviable tasks of communicating with the public,especially with stakeholders – facing the brunt of public anger and so on. Datuk Najmuddin Abdullah and his team from the Strategic Communications and Stakeholder Relations division had done very well in ensuring that things are communicated to and from the public. Datuk Najmuddin is no stranger to the management of crises. He handled the communications during the MH370 and MH17 tragedies. We should also not forget the tens of thousands of Bangladeshi, Pakistani, Indonesian workers who toiled to complete this project under the hot sun, doing work that no Malaysian would, and pouring rain, braving snake bites and dengue fever, who are forever thankful that Malaysia is still the land of milk and honey for them and the families that they feed. If this country is truly going down the drains, they would have quit their job and moved elsewhere.